The leaders discussed North Korea, cybersecurity, maritime disputes, and Crimea – but not nuclear security. According to Deputy National Security Advisor Ben Rhodes, Obama and Xi touched on a number of hot button issues in their talk, including climate change, North Korea’s nuclear program, the P5+1 talks with Iran, cybersecurity, and mil-to-mil relations. While Obama and Xi praised cooperation on issues like climate change and the negotiations with Iran, on several of these issues, the U.S. and Chinese leaders continue to push opposite agendas. On the issue of North Korea, Rhodes said that Obama “underscored the need for close coordination in sending a clear message that there needs to be denuclearization on the Korean Peninsula.” Obama also repeated the U.S. position that a potential resumption of the Six-Party Talks would “be based upon actions taken by North Korea, which has not yet demonstrated its willingness to come to the table seriously.” China, meanwhile, has been pushing for a resumption of the Six-Party Talks without any preconditions, showing a clear discrepancy between Beijing and Washington’s positions. As for cybersecurity, Obama might have been better served to let that subject lie, as earlier this week the New York Times reported that the National Security Agency has hacked into the servers of Chinese tech firm Huawei. The Times report, based on leaks from Edward Snowden, said the NSA breached Huawei’s servers seeking evidence of direct connections between the company and the PLA, but also to ensure the NSA easy access to Huawei’s networks in other countries. Monday, Foreign Ministry Spokesman Hong Lei told the press that China was “seriously concerned” with the reports. “We require the American side to give a clear explanation and stop such behaviors,” Hong added. Xi raised concerns about the NSA’s snooping in his meeting with Obama, according to Rhodes. In response, Obama tried to distinguish between Chinese and American cyber activities using the White House’s rhetorical separation between legitimate intelligence activities and illegal cyber spying aimed at stealing commercial secrets. Accordingly, Obama stressed that “the United States does not engage in espionage to gain a commercial advantage.” Xi is not likely to be mollified by such distinctions. The maritime disputes in the South and East China Seas, fast becoming one of the major issues in U.S.-China relations, also came up at the Obama-Xi meeting. 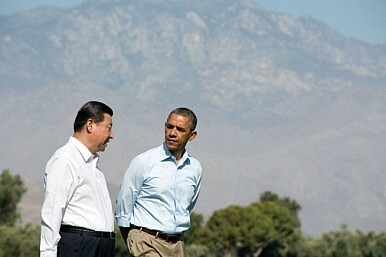 Obama repeated U.S. concerns over the East China Sea air defense identification zone that China announced last November. Obama also highlighted U.S. support for handling the disputes through dialogue, based on international law. However, in a clear sign of U.S. interests, Obama “reiterated his support for the security of our allies, Japan and the Philippines”—two countries that have had especially tense standoffs with China over disputed territories. Xi Jinping told Obama that he should “adopt an objective and fair attitude” towards the disputes, as China disapproves of strong U.S. support for its allies in the disputes. The two leaders also spent time discussing the situation in Crimea. Rhodes called it “a good discussion” in which Xi said that “the principle of the independence and sovereignty of nations was fundamental to their approach.” However, Rhodes also set a low bar for what he would consider Chinese cooperation on the issue, noting that China generally does not engage in sanctions. “I think we would find it as a constructive step for them to continue to refrain from supporting Russia’s action,” Rhodes said. Interestingly, one topic that apparently was not under discussion between Xi and Obama was nuclear security, the theme of the summit that brought the two men together in the first place. Earlier in his presidency, when U.S.-Russia relations were a bit more cordial, Obama successfully pushed for nuclear reductions between the two powers. In 2010, he signed the New START treaty with then-President of Russia Dmitri Medvedev. But there have been no serious efforts to engage with China in a policy aimed at reducing nuclear stockpiles—in part because China’s stockpile is already much smaller than those of the U.S. and Russia (who between them possess almost 90 percent of the world’s nuclear weapons). Still, as Putin in particular has been reluctant to pursue further reductions without buy-in from other so-called “second tier” nuclear powers, it may be difficult for future nuclear drawdowns to progress without Chinese cooperation. To engage in serious discussions, however, would require more clarity than Beijing has been willing to give regarding its nuclear stockpiles. China believes that this very uncertainty is a key part of its nuclear deterrent strategy, and is unlikely to embrace transparency. Beijing also says the U.S. and Russia must undergo much more drastic reductions in their nuclear inventory before it would be appropriate for China to join a multilateral discussion.